As a business, you are part of a community that helps your entity prosper. It’s natural to want to invest in that community. However, you may be struggling to find the appropriate way to give back to it. And whether you are a traditional business or non profit, you may be feeling the challenges of trying to fit effective marketing techniques into your budget. You might consider contributing your products/services directly back to the community. For example, if you sell baked goods, there may be a local soup kitchen or food bank that would graciously accept your donations. If you’re a landscaper, you might cut the lawn of a local church or community center, gratis. A plumbing company could consider donating plumbing services to low-income households in the area. Businesses of all sizes give back by sponsoring a worthy local endeavor. For example, you could sponsor a little league team. This has the dual benefit of helping the community and providing advertising for your business. Having your name on team uniforms would be an example of this. If you’re in a high traffic location, you might sponsor a car wash where students at a local high school could work to raise money for class trips or school supplies. Create an event that will be for all involved. 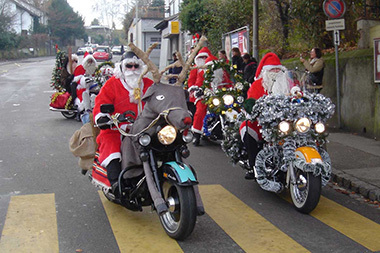 One such endeavor is the annual Christmas Harley toy run. 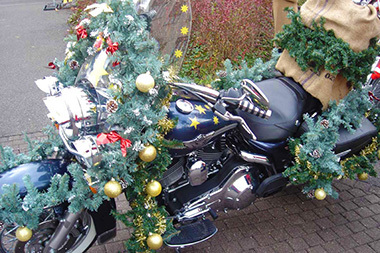 Every year in Southern California, hundreds of motorcyclists dress up as Santa Claus and roar through the streets and freeways early in the morning on Christmas Eve day. They deliver oodles of knapsacks filled with toys and games to kids in need. The event brings laughter and cheer to the community, and always generates a lot of publicity. You could set up a donation box accessible to your business patrons who could contribute food, money or clothing to a local charity or community organization. You might also donate in the name of your business based on what your customers give. If you go this route, enhance your campaign by creating promotional postcards and flyers. 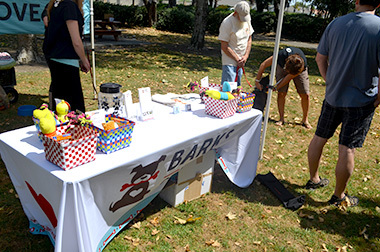 After searching for a way to partner with a community non-profit, Overnight Prints decided on helping Barks of Love dog rescue. Overnight Prints sponsored a trip to the park for the dogs. There, they had local groomers bathe and groom the dogs and provided each pooch with a basket full of treats and useful merchandise. This approach had the triple benefit of helping the non-profit, allowing other local businesses to participate and receive advertising for their own business. Read more about the Overnight Prints Spa-Play Day for Dogs. Plus, it just makes you feel good. 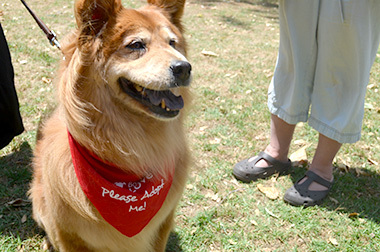 When Ashley Cunningham first started Barks of Love, she was faced with the triple feat of spreading the word, raising funds, and developing long term sustainability. She approached the situation with creativity, drive and the willingness to explore different avenues. In this short video clip, she shares the techniques she used that proved to be the most effective. Carefully research the opportunities available in your community. You can call local schools and churches for some guidance. Select a non-profit that resonates with you—one that you feel connected to. Create a reasonable budget for the project. Stay committed through the end. Think about a cause that you want to contribute to long term so your business becomes associated with it. Partnering with a charity for a special event is definitely a worthwhile activity. Furthermore, many of today’s customers like and even gravitate toward businesses that make a commitment to give back to their local community. As in any business venture, partnering with a non-profit takes some work. Maybe even more than you think. If you are new to the non-profit world, try partnering with someone who is familiar with the protocol, before you start planning your event. As we at Overnight Prints learned, had we first paired up with someone who knew the ins and outs of animal rescue, we most likely would have prevented some unforeseen delays and experienced a smoother process.